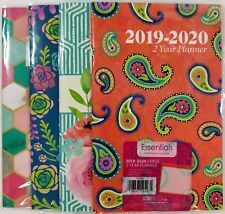 2019 -2020 two year Monthly Planner Calendar. Modern design. One Month per 2-page spread. Trending at $20.07eBay determines this price through a machine learned model of the product's sale prices within the last 90 days. 12 months at a glance, plus 52 weeks shown as one week spread over 2 pages for the weekly section. 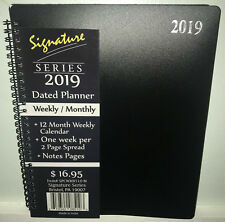 5 out of 5 stars - NEW 2019 Weekly Monthly Planner Signature Series Calendar Black Spiral 8"x10"
27 product ratings27 product ratings - NEW 2019 Weekly Monthly Planner Signature Series Calendar Black Spiral 8"x10"
Deluxe 2019 Planner Collection. - 12 Month Planner. - Weekly and Monthly Layout. This is great calendar for all year organization. Very simple yet very versatile! I am glad you stopped by. - 3 year Quick Reference page. 2019 PLANNER TO ACHIEVE YOUR GOALS - Weekly/monthly planner covers 12 months from January 2019 to December 2019. INCLUDED MONTH TABS will help to access the information much quicker. Each month with Julian Dates can be separated with 12 month tabs. Size Letter Size (8.5"x11"). Works with any pen, marker or highlighter from the Pilot Frixion line (one pen is included). Allow 15 seconds for ink to dry in order for it to bond to our specialized pages. Quantity: 1 Budgeting Workbook. The Monthly Bill Planner and Organizer provide a fantastic way to organize your bills and plan for your expenses. Monthly Budget Worksheet. Format: Paperback. Cover Design: Matte Craft Cover. One year planner for 2019. Features 12 months of weekly and monthly pages for all year planning. Year: 2019. -Yearly Planning pages shows entire year of 2019 on 2 pages for easy research for dates. -Quick Referencing for calendar years displayed for 2018, 2019, 2020 on 1 page. Monthly Format-Black Cover. Rocketbook Wave Smart Notebook, WAVE, 6" x 8.9" NEW! Frixion pen included. The Rocketbook Wave provides the freedom of a traditional pen and paper notebook, while instantly blasting your notes into the cloud using your smartphone.When you use Pilot FriXion pens with the Wave notebook, you can erase your notes using your microwave oven and reuse your notebook. TABS & POCKET & LABEL - Each month is separated with tabs stickers. PROFESSIONAL DESIGN - Twin-Wire binding allows for 360 degree folding over. Past, present and 4 future monthly referencing in the monthly planning pages. This stylish planner will keep you organized everywhere you go. Durable coated tabbed dividers are long lasting and make accessing information a breeze. Premium quality covers and twin-wire bound. Printed on high quality white paper for clean writing space, with premium quality covers and durable, coated tabs that withstand constant use throughout the year width: 11.1 x height: 0.4 x length: 9.3 x weight: 1.06. Spiralbound, 7" x 9" blue cover has 12 pages. You will find great values in kitchen gadgets, bakeware, cookware, lawn and garden, bedding, calendars and office supplies from Walter Drake. Helpful Links. Starts from Jan. 2019 to Dec. 2019. 2019 monthly planner-new:fast S&h. Pink color Now listed Blue & Burgundy & Black Sold OUT(2/16,4/4). With spacious daily blocks and a notes section on the side, this desk pad calendar helps ensure that you're always on top of your busy schedule. A sturdy chipboard backing provides increased protection and a convenient writing surface. Brownline monthly desk calendar displays 1 page per month. 12 months — January to December. Eco-conscious choice — has one or more meaningful eco-attributes or eco-labels. Recycled content — Product contains 50% total recycled content, including 50% postconsumer content, helping you save resources and reduce waste. Forest Stewardship Council (FSC) certified — made from wood/paper that comes from forests managed to rigorous environmental and social standards, supported by the world's leading conservation organizations. January 2019 - December 2019, featuring 12 months of monthly and weekly view pages for easy year-round planning. Monthly Calendars (January 2019 - December 2019). 2019 Planner Details. Planner features full monthly view pages for each month. Perforated sheets (October 2018 - December 2019). Paperboard backing with optional stick-on non-skid pads. Holes for wall mounting. These stickers are the perfect addition to your planner! 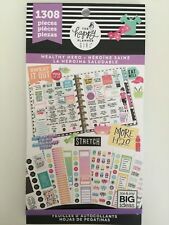 New Release - Happy Planner Happy Notes Micro Mini Squad Goal . Condition is New. Shipped with USPS Media Mail. I have for sale 1 - two year pocket calendar 2019-2020. These are great calendars nice and compact. There is a plastic protectant cover on the outside. Take a look, picture is actual item for sale. Covers 12 months, JANUARY 2019 to DECEMBER 2019. Includes: 2 year reference calendar. 2019 yearly overview. Page size is 8.5”x 11”. Bonus 12 monthly tabs for key intervals in your planner. DOUBLE ZIPPER AGENDA WITH CELLULAR PHONE POUCH. RULER CALCULATOR. 1、This product is sold exclusively byMoko. The portfolio is made of upgraded PU leather, which are water resistant and durable. This product's high quality PU leather cover, sleek zipper, and sturdy stitching make it both portable and durable. Weekly planner is specifically designed to take on the go as the compact size makes it easy to slip into your pocket or bag. New LARGER Size 9.5" x 8"
Black Tan Carriage Pocket Planner. Black Tan Carriage Pocket Planner: Weekly Pocket. This is the footer. More links or text can go here. UPC 033072092475. Product Details. Covers 12 months, JANUARY 2019 to DECEMBER 2019. Give us a chance and let us show you a great FULL 2019 planner experience! Includes: 2 year reference calendar. 2019 yearly overview. Perfect Planner for You. A5/A6/A7 Transparent Leaf Ring Binder Notebook Weekly Planner Diary Cover @YU ! "HEALTHY HERO" MINI 12 Month Planner 2019 January-December. Mini FITNESS PLANNER LAYOUT. 12 Month dated planner. "She's the health nut, the girl who loves her body and loves taking care of it. Her favority accessory is her hair tie and considers a gym bag her purse.